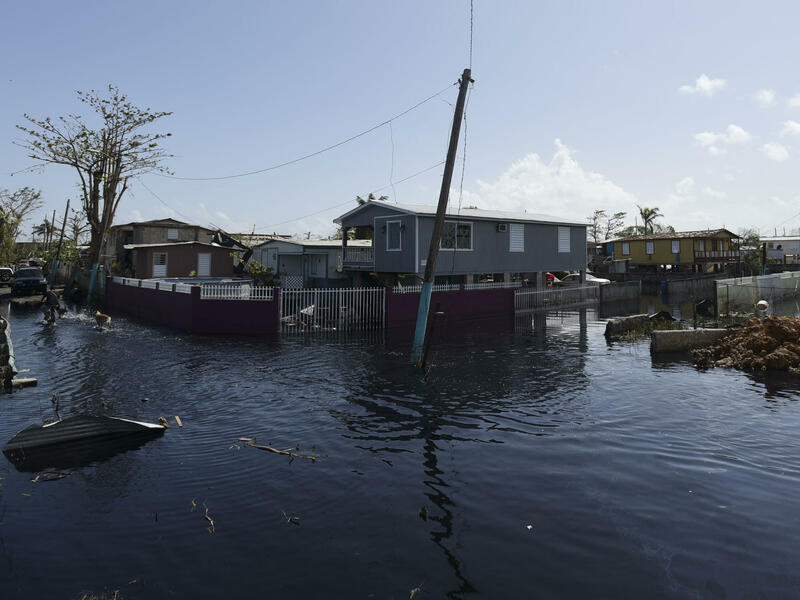 Floodwaters inundated Cataño, Puerto Rico, on Sept. 28, 2017, days after it was hit by Hurricane Maria. Hurricane Maria was the rainiest storm known to have hit Puerto Rico, and climate change is partly to blame, according to a new study. The worst rain fell in the mountainous central part of Puerto Rico, from the northwest to the southeast. That part of the island is rainy under normal conditions. In an average year, it gets more than 150 inches of rain. When Maria hit in 2017, it dropped nearly a quarter of that annual rainfall in just one day. In a paper published Tuesday in the journal Geophysical Research Letters, scientists at the University of Alabama in Tuscaloosa and Sonoma State University in California analyzed rainfall from all 129 hurricanes that have affected Puerto Rico since reliable record keeping began in 1956. They found that Maria was a behemoth compared with past storms that raked the U.S. territory. The average amount of rain Maria dropped on the island in a day — about 15 inches — was 30 percent more than the previous record set by a tropical storm in 1985, and 66 percent more rain than fell on average during what was previously the largest and costliest storm to ever hit the island, 1998's Hurricane Georges. The rain was extremely destructive. It caused widespread flooding, destroyed crucial dams and helped knock out drinking water to nearly the entire island. A previous paper, published by another group of scientists in February, found that extreme rain triggered tens of thousands of landslides in the island's interior, "in some cases isolating communities for days and weeks." In all, current estimates suggest the storm killed about 3,000 people. 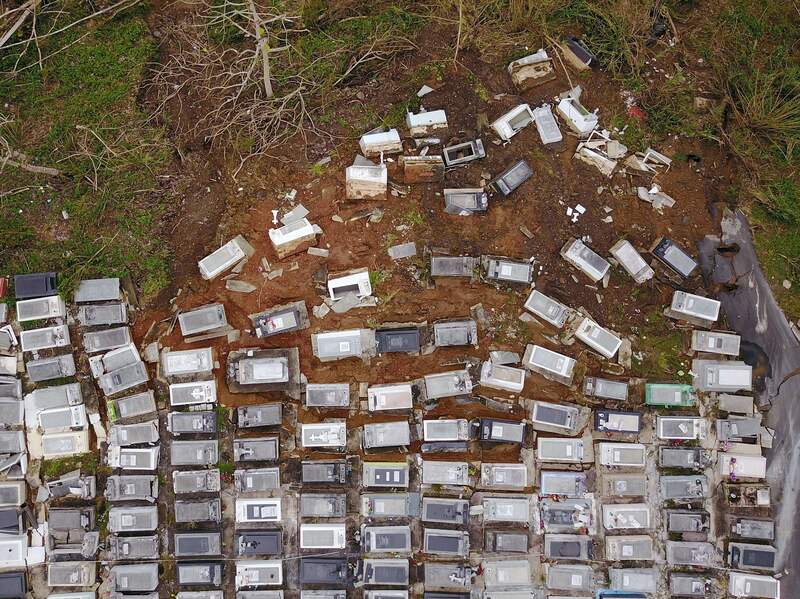 A landslide triggered by extreme rain during Hurricane Maria in 2017 washed coffins downhill from the Lares Municipal Cemetery in Puerto Rico. The new study also set out to answer a question that, just a few years ago, scientists generally shied away from: What was the role of climate change in this single storm? As climate change models have grown more sophisticated, the field of so-called attribution science has grown more robust, allowing scientists to start investigating how our current global climate affects specific weather events. Last year, scientists directly connected the warmest water ever recorded in the Gulf of Mexico to the record-setting rains that fell when Hurricane Harvey hit Texas. This latest paper on Hurricane Maria makes a similar connection. The authors found that a storm of Maria's rain magnitude is nearly five times more likely to occur today, with warmer air and ocean water, than it would have in the 1950s, when global warming's effects were in their infancy. That backs up results published in another paper last year that found climate change is causing some storms to dump 5 percent to 10 percent more rain than they would otherwise. However, the authors caution, more research is necessary to investigate the complex relationship between our current climate and storms such as Maria, especially if policymakers hope to use such research to predict future storm impacts.